Civil engineering projects require a high level of specificity, design, and planning. When engineers use software to create and analyze highways and other critical infrastructure, not only do they need robust tools, they also require a collaborative platform that can improve productivity and project delivery. For all those benefits and more, engineers often turn to AutoCAD Civil 3D. But in order to maximize their use of Civil 3D, users need computing hardware that can optimize software performance. AutoCAD Civil 3D is a popular Autodesk product geared toward the architecture, engineering, and construction (AEC) professional market, but focused specifically on civil engineers. Civil 3D builds on the basic 2D drafting and drawing functions available in AutoCAD by giving users the ability to model 3D designs, conduct analysis, document data, and manage projects. Civil 3D is a leading building information modeling (BIM) solution for infrastructure and civil design, and many of its features are focused on those applications. For example, projects are classified under one of three domains: land development, water, and transportation. While the 3D modeling capabilities are a highlight of Civil 3D, the solution is as well-regarded for its facilitation of project management and delivery. Civil engineers can use the software to automate certain time-consuming tasks, share data, and improve team coordination. With the variety of projects for which engineers can use Civil 3D (roads, highways, highway exchanges, bridges, pipelines, ports, dams, canals and more), the range of the software’s design and modeling is equally enticing. Users can create and edit surfaces, measure cutting and filing materials (like pavement needed for a highway), grade slopes, simulate water, create waterway corridors, and define break lines and contours. Getting the most out of Civil 3D, however, requires a workstation designed to drive performance—and not just any system will work. Civil 3D is most effective when supported by a high-frequency workstation with fewer cores. An ideal option to supply Civil 3D with the power needed to manipulate and interact with large data sets is the APEXX S3 workstation optimized for Civil 3D. The APEXX S3 equipped with an eight core Intel® Core™ i7 or i9 processor overclocked to 5.1-GHz and featuring NVIDIA® Quadro™graphics will provide excellent performance in Civil 3D. Typically ships in 19 - 21 business days. Please refer to the Ship Date on the emailed receipt upon order completion. Analyzing projects is just as important as modeling them in the first place, and Civil 3D excels in this category as well. With Civil 3D, engineers can annotate and see their changes reflected across visualizations in real time. They can also import survey data to adjust their designs, as well as utilize geospatial analysis and sanitary analysis to assess projects. High-frequency workstations are useful for these simulation applications as well. Particular models that support high-level performance include the APEXX X3—with an Intel® Core™ i9 processor. This would serve as one of the best computers for AutoCAD Civil 3D available. Whether you’re editing feature films or deploying cutting edge VR experiences, the APEXX X3, with support for up to three graphics cards and 128GB of memory, is an ideal platform for extreme multi-taksing in your complex production pipeline. Civil engineers are often in the field, surveying the infrastructure projects they're planning and designing. When on-the-go, they need a mobile workstation laptop that can keep pace and support high-level use of Civil 3D. 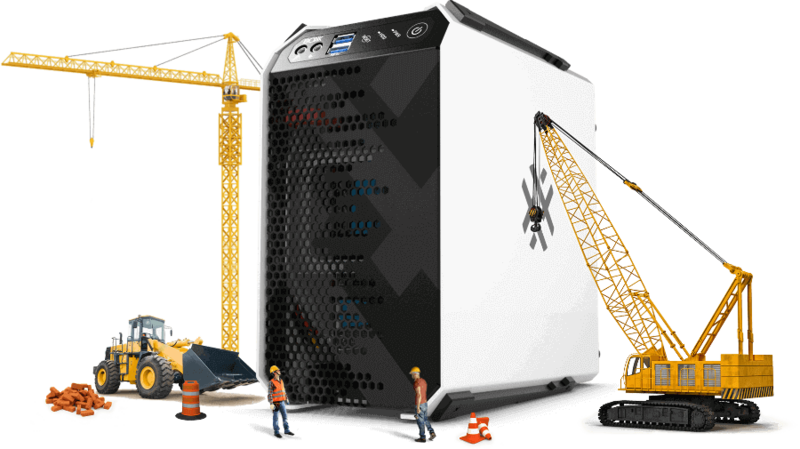 Civil engineers have a number of options, but the standout mobile workstation is the GoBOXX MXL featuring an 8th generation, desktop-class Intel® Core i7 processor, NVIDIA® graphics, and up to 64GB of memory. The GoBOXX MXL has proven itself to be on of the best laptops for AutoCAD Civil 3D.